DOB: February 26, 1857. Mornington, Vic. DOD: June 07, 1929. Adelaide Hospital, South Australia. Alfred Edward "Topsy" Waldron (left) is pictured in his Norwood playing days. In 1926 he was asked how he got his nick-name. He said his brother had named him 'Topsy' and when he went into football the name just stuck. Defender, recruited from Montague and Albert Park. Another report said A. E. Waldron came from Carlton Imperials in 1877. 1877 Did not play well at first, owing to holding on too much, soon saw it's folly,and improved very much afterwards, and promises to make a really good player, much liked by his comrades for his gentleman demeanour. 1877 Waldron was in the Carlton touring side to play matches against the Waratah Club in Sydney. 1878 A. E. "Topsy" Waldron played in both Carlton-Waratah matches at the M.C.G. on June 29 (Rugby) and July 1 (Australian Football). A leading player of 1878 "a back player par excellence", the last hope of his side, difficult to hold and most effective in runs and good kicks and went to Norwood in 1879*. Carlton lost a fine player in A.E.Waldron who moved to Adelaide. In 1878 a Sydney club had held out inducements to Waldron to transfer to N.S.W.,but he decided to accept an Adelaide offer instead. It was probably the first of the many cases in interstate trafficking in players. 1878*, 1879, 1880, 1881, 1882, 1883, 1887, 1888, 1889, 1891*. Former Carlton players Billy Dedman and a W. 'Billy' Bracken also played in some or all premierships. -* Differing years when leaving Carlton and starting at Norwood. He joined Norwood in 1879 and only played in 8 premierships for Norwood, missing 1878 when still at Carlton and 1891 when he had retired and had joined the umpiring fraternity, but still remaining a member of Norwood's committee. Carlton players who were enticed over to Norwood in 1878 were Alf McMichael (1878-1880 and Norwood’s first vice captain), Billy Dedman (1878-1880 and their leading goalscorer 1878-79), Billy Bracken (1878-1880) and Alf Wishart (1878). L. Bracken joined in 1880 (for this one season) and George Bragge (joined in 1881 and remained to 1885 before rejoining Carlton). “An area in the picturesque East Parklands near the tramway, and opposite the Kent Town brewery in which the club patron, the then Mr. Edwin T. Smith, had a controlling interest, was the club’s first home ground. It was there that Topsy Waldron, who along with Billy Dedman and Billy Bracken transferred from Carlton, revealed his rich talents to the State’s emerging football fraternity. Other Victorian players Alf McMichael, the first vice-captain (another Carlton player), Lou Suhard and “Jammy” Watson from Melbourne, North Melbourne’s Joe Traynor and “Curly” Pollock, who had played with distinction at Hotham Hill, were excited by the raw talents of Waldron. Norwood was to provide the vehicle for Waldron to reveal his skills and his generalship throughout the colonies. Waldron succeeded Osborn as captain in 1881. He immediately revealed a flair for the position and was considered by many experts of the day to be without peer throughout the country. Victorians first witnessed his brilliant strategy when Norwood played South Melbourne in 1882. The match ended in great controversy after Waldron had clashed with Latchford, a South Melbourne player. The dispute, the details of which were never revealed, sorely strained relations between the two clubs. "Waldron was the focal of a scandal which shook the club to its foundations in 1886. Replaced as captain by Alf Roberts (after the 1884 season), Waldron sensationally charged Mr. Henry Charles Burnet, a club founder, with excessive fraternization with umpires. “There was further consternations concerning the activities of Waldron in 1891. After 12 years of service to Norwood, eight of them as captain, Waldron elected to join the umpiring fraternity. However, he remained a member of Norwood’s committee of management. During the year the committee decided the club should visit Tasmania. A clique within the committee contended that Waldron should not be permitted to make the journey unless he resigned his umpiring commission. Waldron was angered by the hardline attitude, and eventually the committee agreed that Waldron should join the party, which was financed by a loan from the patron, Sir Edwin Smith. "Four years later, under the direction of Scott, it was to win its 18th premiership. But Topsy Waldron was not to witness the triumph over Port Adelaide. He would have wept tears of joy at the success but, as it was, tears of sorrow were spilled at his passing on 7 June. Fifteen months and one week earlier he had been one of the club’s most celebrated captains of bygone winters asked to extinguish 50 candles on a birthday cake that was ceremoniously carried before members at a smoke social after the jubilee annual general meeting of the club on Tuesday, 28 February 1928. His life had now been extinguished in a premiership year. Topsy was dead. Long live Norwood." “Forward! Norwood, red and blue. Beauty’s lips are praised you. Cheer the bonny red and blue. Cheer the colour fast and true. Keep the honours still in view. "Waldron died a pathetically lonely man. He believed only his Norwood Football Club truly loved him. In the summer of 1928-29 he told members of the committee that he would like to be buried by the club as he felt he was without friends. The club was willing to comply with the request and when he died approached the family for their permission. The committee was told that “the relatives thanked the club for their offer to bury the remains, but that they wished to carry out the last rites themselves.” It was then that Norwood decided to erect a memorial above the grave. "The rumor that Waldron had resigned his position as skipper of the Norwoods is incorrect. It is true, however, that the genial Topsy had an intention of retiring, but after the Souths beat his team he determined to remain with them." South Australian Advertiser from an article by Jack Reedman of "Football in the Eighties." "Topsy Waldron skippered the redlegs in masterly fashion. He invariably out-maneourvred the opposition captain, and was awfully strict in the matter of keeping your places. He was keeness personified, and woe betide a young player if he strayed from his appointed station. My word! He used to tell the erring ones in no uncertain tones. Topsy generally gave himself a roving commission. He was here, there, and everwhere, getting a well directed kick and urging others to follow suit." Former Carlton player & VFA/SAFA Umpire Frank Coffey writes about Topsy in his column for the newspaper Sport (Adelaide) September 03 1926. A. E. "Topsy" Waldron received injuries from a fall from scaffolding. He died a few days after the accident on the morning of Friday 7th; he was aged 72. The above article seems to be incorrect with his date of death. If someone in Adelaide could take a photo of Topsy's headstone at Payneham Cemetery and send it on to Blueseum it would be greatly appreciated. The Adelaide Advertiser mentioned that Waldron's brothers played football. 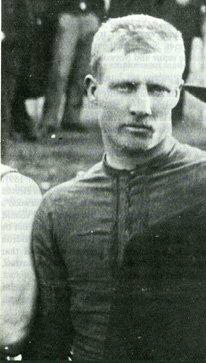 Frank 'Daddy' Waldron played for Melbourne. Herbert Waldron played in the Ballarat district. The youngest, Arthur Waldron went to Collingwood and played in the early days of that club. Collingwood has listed Ern Waldron in its early VFA days. Contributors to this page: blueycarlton , pblue and WillowBlue . Page last modified on Tuesday 16 of May, 2017 13:50:04 AEST by blueycarlton. 1996 Qual. Final Vs WCE - Stephen Kernahan. 2001 - Craig Bradley 350th game Interview (pg 2 of 3) 01/08/01.